Who We Are – Epp Siepman Engineering Inc.
Epp Siepman Engineering provides mechanical & electrical engineering consulting services for the building construction industry. Our project experience includes a wide range of projects in the educational, commercial, health care, industrial, and hospitality sectors. We also provide engineering services such as feasibility studies, life-cycle costing reports, energy modeling, and systems commissioning. Epp Siepman Engineering was founded by David Epp, P.Eng. and David Siepman, P.Eng. in 2005 as a mechanical engineering consulting firm. Matthew Penner, P.Eng. joined the firm in 2013 and is our partner in charge of electrical engineering services. Our staff of over 20 people bring value to our work with a range of expertise and experience, providing integrated mechanical and electrical engineering consulting for a wide variety of projects and clients. Our goal is a flexible design approach that will assist clients in meeting their project objectives. We value integrated design solutions that minimize environmental impacts through sustainable design. We provide quality service to our clients through clear communication, dedicated personnel, and a team approach with other design consultants. From inception, one of Epp Siepman Engineering’s core values has been applying sustainable design to our projects, using a holistic, multi-disciplinary team approach. Five of our staff are currently LEED-registered professionals. We are motivated to apply energy efficiency and conservation measures into any project, with the end goal of real savings in energy and resource consumption and an optimum built environment for the occupants. Integrating the mechanical and electrical sustainability strategies into the overall building design is done by working closely with all the design professionals on the team as well as building owners and contractors. We are focused on providing our clients with practical solutions that meet their requirements. We do this with an emphasis on effective communication which involves listening to our end clients and other consulting team members while making sure we ask the right questions at the right time. Taking the time to properly understand their objectives and help balance them is critical in delivering a successful design that meets the client’s needs while respecting the project budget. Our goal is to be flexible in our design approach so that our systems will facilitate ease of maintenance and will assist building owners in the cost-effective long-term operation of their systems. Epp Siepman Engineering were early adopters of BIM and utilize Revit as a design and production tool. We have taken BIM to the next level by creating custom software which integrates our various design software packages including Revit. This process allows us to start our design work earlier and makes it a fully iterative process where early schematic design work is built upon as opposed to redone or reworked. This customized approach allows us to tackle projects of size in a quick and efficient manner. Integrating mechanical and electrical for design and production by using the latest building design tools contributes to consistent and accurate final product. 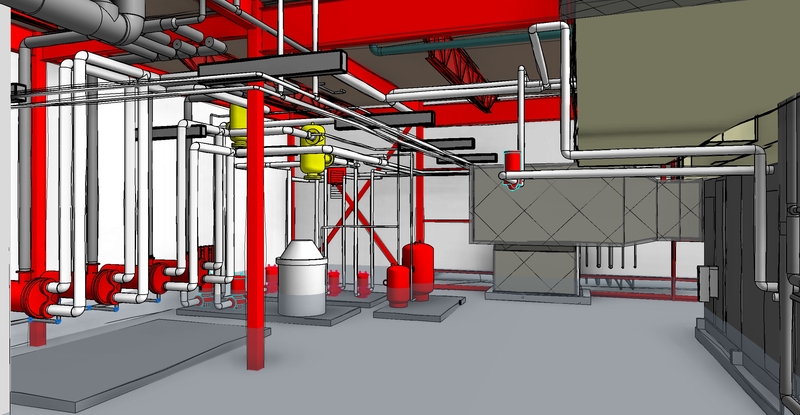 Using building information modeling enables us to integrate mechanical and electrical information more effectively and to ultimately develop a construction drawing set that is accurate and well-coordinated with architectural, structural and other design disciplines.